During the war of 1914-1918 many Czech and Slovak soldiers in the Austro-Hungarian armies surrendered to the Russian army. After the war 70.000 of these formed an army in Siberia and fought the Bolshevists. 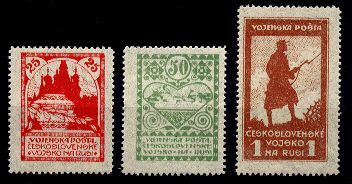 They issued stamps for their own postal services and these were also sold to the public on the Siberian Railway.